Mauser is the common name of a German arms manufacturer, maker of a line of bolt-action rifles from the 1870s to present. Their designs were built for the German armed forces but have been exported and licensed to a number of countries since the later Nineteenth and early Twentieth Centuries, as well as being a popular civilian firearm. In the late Twentieth Century, Mauser continued to make sporting and hunting rifles. In the 1990s it became a subsidiary of Rheinmetall. Mauser Jagdwaffen GmbH was split off and continues making rifles, while the Rheinmetal subsidiary, called Mauser-Werke Oberndorf Waffensysteme GmbH made other products for a time before being merged into Rheinmetall Waffe Munition Gmbh. The Mauser name has also sometimes been licensed by other companies. What was to become a Mauser, or Mouser, factory opened on July 31, 1811, when Friedrich I of Württemberg established a royal weapons factory in Oberndorf, a small town in the Black Forest. The factory opened for business the next year, employing 133 workers. In 1867 Wilhelm and Paul Mauser developed a rifle using an improved rotating bolt system for breechloaders based on the Chassepot (fusil modele 1866), itself a much improved version of an earlier Prussian design, the Dreyse. The Franco-Prussian war had shown their current rifle inferior to the Chassepot, so in 1871 the Mauser Model 1871 became the standard German infantry rifle. 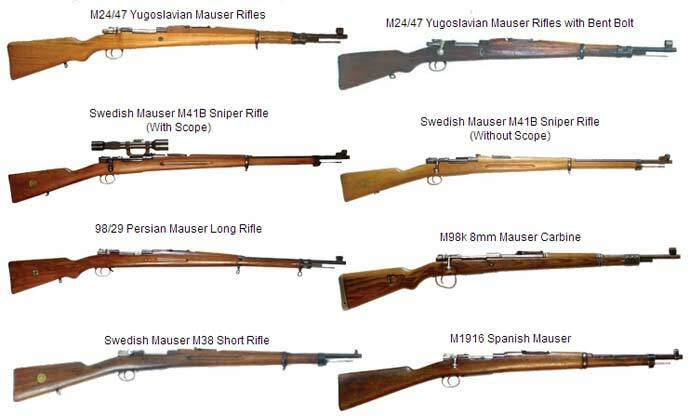 Note that the model names of the following Mauser rifles are split between company designations and German military designations. For example, the Mauser Model 92 was not adopted by Germany, but the Mauser Model 98 was adopted as the Gewehr 98, though some designations also use the Model. The last years of 19th Century saw a sort of "arms race" regarding developments of small arms. In 1886 the French Army introduced the Lebel Model 1886 using smokeless powder, allowing smaller diameter rounds to be propelled at higher velocities, with accuracy out to 1,000 yards; most other military rifles became obsolete. Its disadvantage was a tube magazine. The German army introduced the best features of the Lebel in the Gewehr 88, also known as the Model 1888 Commission Rifle (Judenflinte), along with a modified Mauser action and a Mannlicher style box magazine. There was also a Carbine version, the Karabiner 88; both would be updated in the 1900s and see limited use in WWI. Note that this was not a Mauser designed and engineered rifle, as wrongly believed by some. This weapon was designed around the new 7.92x57 cartridge commonly known today as the "8 mm Mauser" because it was used for later Mauser models. This incorporated the advantages of smokeless powder and higher velocity found in the Lebel. The cartridge was rimless which allowed smoother feeding for both rifles and machine guns. The original bullet had a round head; several redesigns including the adoption of the spitzer bullet with a sharp point and boat-tail brought the cartridge to its current potency. Only later versions of Gewehr 98, or converted 88 and 98 rifles could fire the improved "S" cartridges. There are several Mauser variants, click the links in the menu to in the left column.